Starting off with one of our most long-standing senior managers we have Brittany! Brittany has been with San Juan Safaris and Outfitters for 8 years! Brittany moved to the Pacific Northwest within one week of college graduation to pursue her dream of “thriving in the outdoor adventure industry.” She began her career in the outdoor adventure industry with San Juan Island Outfitters in 2010. Since then she has worn many different hats including marketing, operations, customer service, sea kayak guide, and naturalist. An education internship with the Racine Zoo, Racine, WI. She has also taken some courses in digital marketing and has continued educating herself in both communications and digital marketing. Brittany is CPR certified and is excited to be currently pursuing her nursing degree! She says her ultimate goal is to put her nursing degree to use in the outdoor adventure industry in locations close to the wilderness to support expedition groups. Her love for everything outdoors was alive from a young age. Brittany grew up in an outdoor-focused Midwest family. She says her summers were spent kayaking, canoeing, camping, and spending time in nature. “Essentially, my love of the wilderness started before I could walk!” Brittany says. 2 day/1 night snow camping in the Mount Baker Wilderness. Along with countless multi-day backpacking trips in the North and Central Cascade Mountains of Washington State! Next up we have Captain and Lead Naturalist and Vessel Coordinator Sarah! Captain Sarah has been with San Juan Safaris and San Juan Outfitters since 2014!. She has a Bachelor of Science in Wildlife and Conservation Biology from University of New Hampshire in Durham, New Hamphire. While there, Sarah participated in research projects including, remote monitoring of bobcats using camera traps worked as a naturalist for the Mass Audubon, and studied abroad in Ecuador and the Galapagos Islands. Sarah also has spent time working in Maui, Hawaii as a marine biologist and naturalist in and around the Hawaiian Islands. While there, Sarah worked on ongoing data collection, performing numerous crew duties, and educated passengers about the geology, geography, natural history, ecology, culture and marine life of the Hawaiian Islands. Now, Sarah calls Friday Harbor, San Juan Island her home full time. As Lead Naturalist & Vessel Coordinator for San Juan Safaris and San Juan Outfitters, you will find Sarah doing many things for our company from managing a team of naturalists, curating educational materials on board each vessel, and making sure that the whale watch vessel fleet is well equipped, stocked, and safe. Sarah recently earned her USCG Master Near Coastal 100 Ton and Assistance Towing Endorsements making her an official Coast Guard Certified Captain. When she is not working on the whale watch and wildlife tour vessels as a naturalist, you’ll find her most often driving our whale watch vessel M/V Sea Hawk for San Juan Outfitters from Roche Harbor, San Juan Island. Jess has many certifications including EMT-basic, WFR, CPR, OEC, MPIC, BCU 3 star, and is BCU 4 star trained. Wow! She’s also proud to be a LNT (Leave No Trace) trainer, has her avalanche level one certificate and Washington State food handlers as well as having recently received a certification in phlebotomy. In addition to being a Senior Expedition Leader for San Juan Outfitters, Jess also worked in sea kayak guiding in Patagonia for a company in Torres Del Paine National Park and ski patrols in the winter. Jess has had her fair share of adventures including backcountry skiing in the Wasatch Mountains of Utah, mountain biking, trail running, pack rafting southern Utah, backpacking Iceland, trekking to Everest Base Camp, hiking the Cullins of Scotland, and backpacking in the W trail in Patagonia. She even found time to volunteer by coaching girls hockey for several year as the assistant coach. In her free time, you will find Jess doing something active. Jess spends her days away from San Juan Island in the North Cascasde Mountaisn to hike or backpack, mountain biking or road cycling. During the winter months, Jess is usually out backcountry skiing and touring up mountains or hiking with her dog, Chief. This is Claire’s third season working for San Juan Outfitters. Claire has a Bachelor of Science in Environmental Science from University of Wisconsin at Milwaukee and her Wilderness First Responder Certificate. We'd be lost without Claire! Claire says how she spends her off time completely depends on where she is living. When Claire is here in the Pacific Northwest, she enjoys sunset watching, trying her hand at mountain biking, sea kayaking, yoga and other less active things like Netflix watching, reading and checking the news 50 times a day. When in California, Claire says there's a lot more climbing and beach time involved. Alexandria is in her second season working for San Juan Safaris and San Juan Outfitters. In 2016, she graduated from University of Puget Soundwith majors in Science, Technology, and Society with a Marine Biology Emphasis, as well as Communication Studies. Alexandria also minored in Education. With majors in such different disciplines Alexandria jokes the dream is to be “Bill Nye the Science Guy Jr… Alexandria the Science Gal.” In all seriousness, she loves how working in outdoor adventure education allows her to utilize all her skills in science, communications, and education. She often jokes on the boats that this job allows her to combine two of her favorite things: Whales and captive audiences! Alexandria has experience working with the Marine Mammal Stranding Network on San Juan Island, wolf rehabilitation, and marine mammal rescue & rehabilitation in her home state of California. She has also very much been enjoying volunteering for Island Haven Animal Sanctuary on San Juan Island, and says her favorite has to be helping with enrichment for their two resident goats named Taco and Tamale. 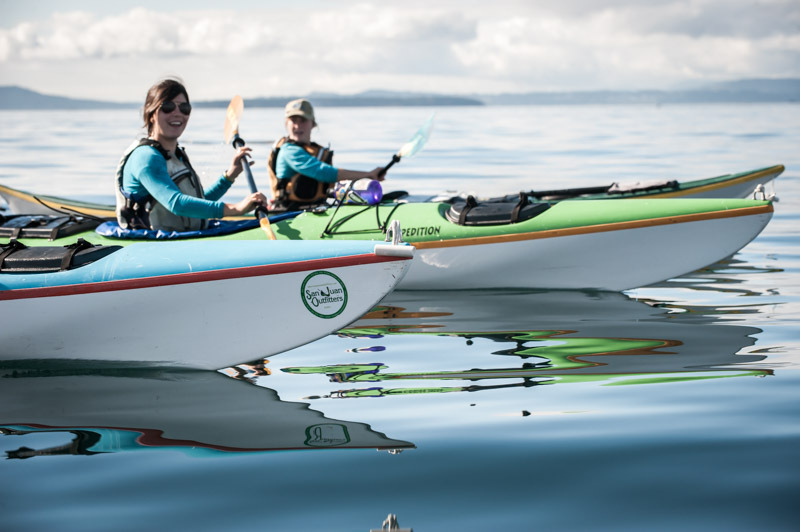 Having been born and raised in Southern California, Alexandria first fell in love with the Pacific Northwest when she and her mom went on a multi-day kayaking tour with San Juan Outfitters. After enjoying spending time on the island, she knew it was a goal of hers to return to the area to work on the other side of things! Having had such an amazing time on that trip, she knew when it came to apply to colleges it was time to break out of her “Los Angeles/Orange County bubble” and go on an adventure! While studying at the University of Puget Sound, Alexandria was Resident Programming Advisor and Residents Assistant for the outdoor education themed hall where she planned numerous events and activities for the community including many hikes, camping and overnight backpacking trips, and kayaking trips around the greater Puget Sound region. She has also traveled all along the west coast; between college and working on San Juan Island, Alexandria has done that drive 11 times and counting! In additiion to Oregon and Washington, Alexandria also spent time in North Carolina, Hawaii, Canada, Mexico and the Bahamas. After graduating from Puget Sound University, Alexandria found her way to Friday Harbor, San Juan Island and began her position with San Juan Safaris and San Juan Outfitters. Now a two year verteran, she enjoys wearing many different hats. Most days, you'll find Alexandria on one of our four whale watch & wildlife tour vessels as a naturalist and first mat. She is also part of the reserations ans sales team, assists with marketing and media, and even occissionally in the Riptide Cafe. Tenley just completed her first season with San Juan Outfitters and San Juan Safaris. As a recent graduate from Friday Harbor High School here on San Juan Island, she is currently attending Seattle Pacific University and with a major in General Business. This is just a short glimpse at some of the amazing wild women we have on our team here at San Juan Safaris and Outfitters. Each of these ladies brings something uniquely wild to San Juan Safaris and San Juan Outfitters, and all of them are worth celebrating. Cheers to all the wild women out there!